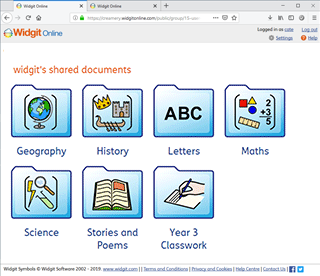 Widgit Online provides a platform for you to host documents which can be shared with anyone who has an internet connection. When accessed, other people will be able to view, listen to or print your document. Documents can be ‘Published’, making them available to anyone with your published folder web address. Documents can also be privately shared through a 'Direct Link', meaning that only people with a unique web address can access them. Note: Please read the e-Safety Guidance before publishing documents. You can publish multiple documents from the Documents page. Tick the checkboxes for the documents and/or folders that you want to publish and then click the Publish button. You can also publish a document when viewing it (not editing) by clicking the ‘Publish’ button. You can use the same methods to Unpublish documents and folders. Direct Links are links that you can share with anyone to give them access to a particular document. This link will display the document, but not reveal your username or group name. To create a direct link, view the document that you would like to share and then click the Direct Link button at the bottom of the page. You will then be able to Enable direct link. If you want to disable your direct link, you can repeat the same steps and choose Disable direct link. Note: Anyone who knows this direct link can use it to view the document, regardless of whether or not it is published.